If you haven’t made a New Year’s resolution to protect your technology, you’re a sitting duck for the next virus that comes along. And with reports that show medical data breaches are resulting in lackluster performance for online identity sales on the dark web, hackers are turning to more and more inventive ways of making money. The recent news of the infect-your-friends Popcorn Time ransomware is proof that hackers are working overtime to make a buck. Lucky for you, you did decide to make 2017 the year that you secure your data with strong antivirus protection, and Advanced SystemCare Ultimate 10 by iObit is the right tool for the job. This PC security software offers a lot of protection bang for the buck, from real-time monitoring to system cleaning, all with ad-blocking capabilities. It includes protection from DNS attacks, browser tracking issues, and homepage tampering problems, while offering the newly launched FaceID and Surfing Protection for optimal security. One of the best features is its vast database of recognized threats. Any security expert can tell you that your antivirus software is only as good as the dangers it knows about; failing to install a high-quality software and not updating that software routinely means your computer isn’t fully protected. With Advanced SystemCare’s top-notch database, there’s a good chance that it recognizes the threat before your computer does. Best of all, like any solid New Year’s resolution that turns into a lifelong good habit, Advanced SystemCare features a lot of one-click options, meaning protecting your computer won’t be complicated. In order to make network security a focus for more than the amount of time you actually spend following through on that “go to the gym” resolution, using the one-click Clean & Optimize control helps you get rid of unwanted junk and files that are clogging up your system. 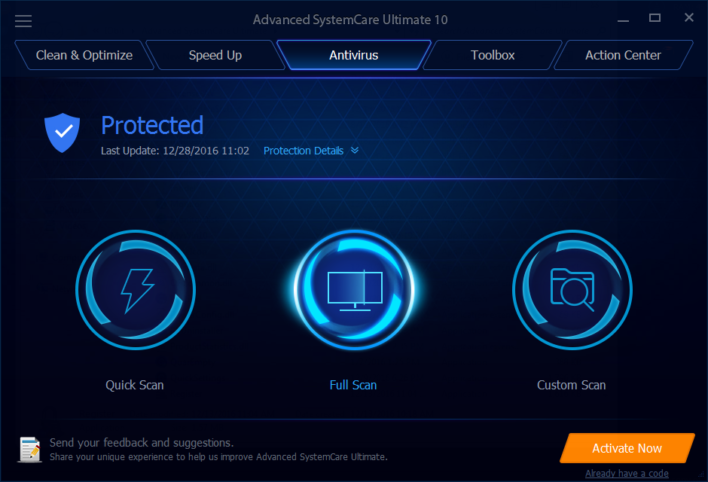 To try Advanced SystemCare Ultimate 10 for yourself, download it here. Don’t worry, it’s been fully configured for a variety of Windows operating systems, including Windows 10.